Dr Per Perersson is currently working as a researcher at the Royal institute of Technology in Stockholm, Sweden and earned his PhD from Uppsala University in 2011. Currently his main focus of research is ion beam analysis of fusion materials and development of analysis techniques. 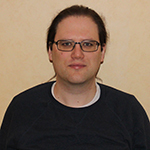 He is also sub project leader with focus of ion beam analysis for EUROfusion: Plasma-Facing Components in JET. He is author or co-author of over 60 refereed scientific publications in peer reviewed journals. In the ITER design the divertor, which is the part of the plasma facing components of a tokamak with the highest heat and particles fluxes, is planned to be made of tungsten as it is very heat resistant and exhibits low sputtering yield. For future fusion machines Tungsten is considered for the full wall. Currently tungsten is used in many tokamaks such as JET were both solid tungsten and tungsten coated carbon tiles are used. Coating of existing carbon tiles with tungsten has proven to be an effective method of providing tungsten walls to several fusion machines that previously had carbon plasma facing components in a fast and economically manner. This method does however provide some changes in properties of the tungsten components such as maximum temperatures allowed and surface roughness. When operating with a tungsten wall you need to inject some gas to efficiently reduce the energy of the ions before they reach the wall. In JET this is primarily done with nitrogen or possibly neon. It is also important to keep track of the fuel (deuterium) which has historically been found together with carbon, the formation of tungsten oxides can also be a problem. Deuterium, nitrogen, neon, oxygen, carbon along with tungsten and beryllium, that makes up a big part of the wall, consequently become important elements to keep track of and detailed studies of these elements are performed in post mortem analysis by techniques such as ion beam analysis. The transition from carbon to tungsten as main plasma facing components at JET has so far been a success in that it has supported a design change for the ITER divertor that now is planned to start with a full tungsten configuration compared to a previously suggested tungsten carbon mixture.